Dressing in vintage can, unfortunately, be a little harsh on the budget sometimes, but, I definitely do not let this stop me from dressing the way I want. There are so many ways that you can make your money go a bit further, but still keeping a retro vibe. When I started my blog, I really wanted to keep the budget in mind, since I myself, am a lady on a budget. I am so excited to share some of the things I do in order to save some money in fashion. I hope that you find these tips helpful. 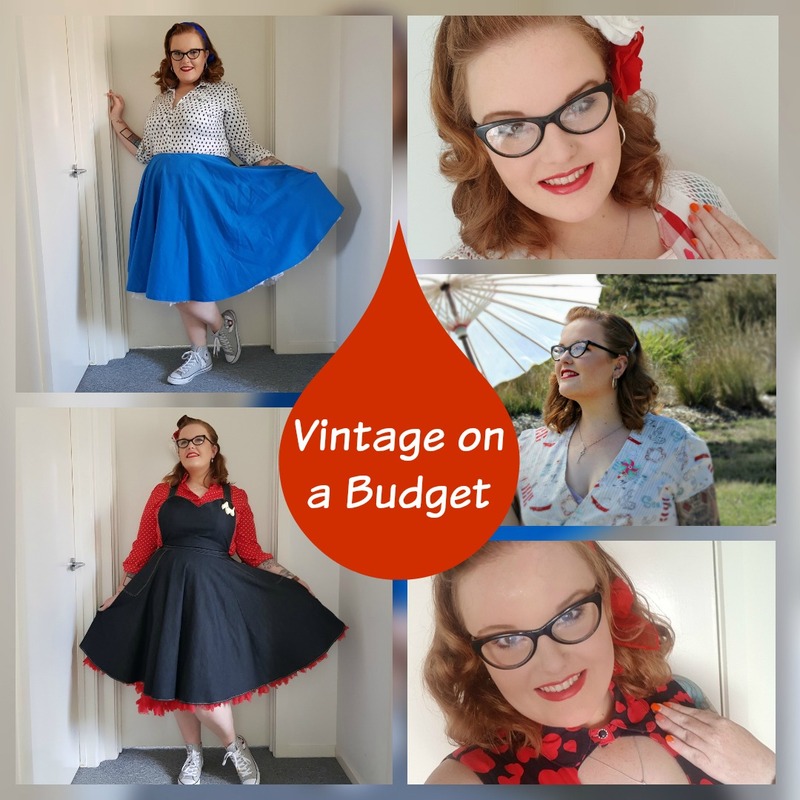 In order to dress like a vintage lady, key pieces might not be found at your regular shopping centre, however, there are lots of basics you can buy to go with those key vintage pieces. I have purchased a lot of my tops from shops like Kmart and find that they look just a great and vintage with my skirts. I have also bought sweaters, jeans, belts and even shoes from regular shops. Thrift shopping is one of my favourite things to do because not only do you save money, but you really never know what you are going to find. I have found amazing sweaters, tops, dresses and accessories from the thrift shop. A lot of my go-to items have actually been found at the thrift shop and even though there are times there where I will nothing I like, sometimes you just find gold. I also find that there are a lot more retro looking items at thrift shops vs regular shops, so it really is a win-win. eBay is such a wonderful place to find extremely affordable things, but in the vintage world, I find it great for accessories. I have bought a lot of great vintage vibe accessories from eBay including hair flowers, scarves, brooches, earrings, bracelets, petticoats and a parasol. You can find things for really cheap and although there are some things I would not buy from eBay, some things are really great. I recently bought a petticoat from eBay and I was extremely surprised by how good it was. I am still a little new to Buy & Sell groups on facebook, but there are so many amazing clothes out there that are much more affordable on these groups. If you don’t mind buying second-hand clothing, then you will definitely save money. I have bought a few things so far and all of the items have been basically brand new and yet I saved a fair amount. I know this is not a tip that everyone will be able to do, but making your own clothes is really so exciting but also saves money. Fabric can cost all different amounts, but I try to get mine on sale since, in order to make a vintage item, you will need a fair amount. You will need to own a sewing machine and know how to sew, but once you learn, it really is worth it. I have been recently learning how to make dresses and I am so happy with the ones I have made so far. Making your own clothes is extremely rewarding. I hope you guys enjoyed this post and will hopefully use some of these tips to save money. I truly believe that you do not need a lot of money to look good and I really believe that I try to do this regularly.